This pedestrian bridge was built to carry visitors across the Seine and to the 1900 World's Fair. It was moved slightly upstream, had its name changed, and it was threatened with removal several times before finally obtaining historical status in 1966. The engineer, Jean Resal became an expert in metal arch bridges, having designed the nearby Pont Alexander III and the Viaduc d'Austerlitz. The main span of the Passerelle Debilly (named after a fallen general) is a 75 m (246 ft) long through arch with 22.5 m (74 ft) long half deck arches for the approach spans. Stairways carry pedestrians on and off the bridge. The deck is only 8 m (26 ft) wide and it's supported by floor beams held up by metal plates attached to the arch ribs. 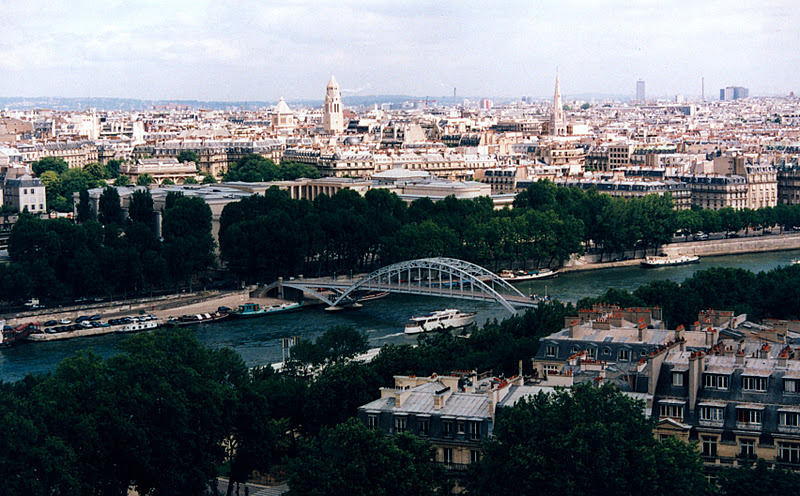 This photo was taken from the second level of the nearby Eiffel Tower. Note how beige the City of Paris is in this photo and how close the hilly countryside appears. Seine River Bridges: Passerelle Debilly by Mark Yashinsky is licensed under a Creative Commons Attribution-NonCommercial-ShareAlike 3.0 United States License.